Imagine the versatility of a single press platform that can be configured for either a shell or cupping application. 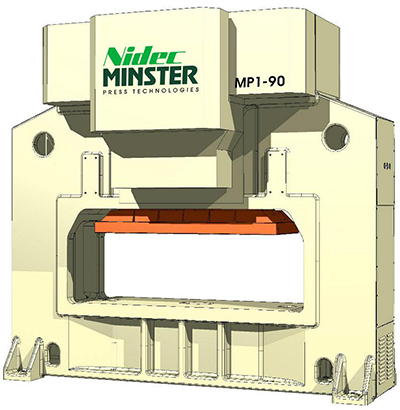 That’s the versatility afforded by the new MP1-90 portal press from Nidec Minster Corp., Minster, OH. "We sought to offer a low-cost, robust, durable and reliable press for this segment of the metal-packaging industry," says company CEO David Winch. Rated at 90 metric (100 U.S.) tons, the MP1-90 press is capable of 250 strokes/min. in shell applications and 150 strokes/min. in cupper mode. The press also features a 100-mm shut-height adjustment, and a cast-iron frame and forged steel crankshaft that minimize deflection. Oil-film bearings give the press precision bottom-dead-center repeatability, while the combination hydrostatic/hydrodynamic guiding system allows for precise slide guiding, infinite bearing life and optimized part quality. The MP1-90 press includes a Minster pneumatic clutch and brake with a proven record of long life and dependability. A hydraulic-overload feature in the slide protects the press frame and components in case of an overload condition.